So exactly what is the true meaning of Christmas? There are moments in your life that are overwhelmingly beautiful. Your wedding day - I have stood beside many grooms who have cried like a baby on their wedding day - overwhelmed at the beauty of their bride coming down the aisle. That dream vacation - When you wake up and look outside at God's creation and you are speechless. It might have been a turquoise colored ocean, a white snow capped mountain, a rusty red canyon or a meadow with multiple shades of green, but it was an overwhelming sight. Graduation day - years of study are now behind you or your child and the music of "Pomp and Circumstance" hits you like a ton of bricks, and without warning tears are rolling down your cheeks. You are again overwhelmed. The birth of a child - There is something wonderful about watching a new life enter this world. You are the parent or the grandparent or the aunt or uncle and words escape you. You are overwhelmed You are overwhelmed at the miracle of birth. There has never been a birth more overwhelming than the birth of Jesus Christ. His birth is the only birth that is internationally known and celebrated. Imagine what it must have been like for those who were present at the time of His birth. They were captured by His glory. That is the shortened version of the birth of Jesus Christ. Everything about this birth is simply overwhelming. What is so overwhelming is that God would visit man. The eternal God becomes man. He was willing to give up heaven for us. How He did this is also amazing. The Old Testament is filled with prophecy about His birth - and every word has been fulfilled! Virgin Birth - Not only has that never happened before; it is also impossible. However, Isaiah 7:14 predicted a virgin birth. Then an angel came to a young virgin girl and said: "You will have the Baby Jesus." Mary herself was overwhelmed and said, "How can that be? I am a virgin." (Luke 1: 34) This is God's child, and overwhelming truth. Born in Bethlehem - Nothing big happens in little Bethlehem. But Micah 5:2 said that little Bethlehem is where Christ would be born. Caesar Augustus had no plans of being part of this Christmas story, but he was. It came to pass in those days that there came a decree from Caesar Augustus that all the world should be registered. Mary and Joseph had to go back to their home town of Bethlehem to obey the law. Every detail that was predicted came true right down to the visitors that would come to see young Jesus - shepherds and rulers would bow at his feet, the king would get mad and try to kill Jesus, causing many babies to die, a forerunner would proclaim Christ's coming, and His upbringing would be in Egypt as a result of running for His life. The truth that is fulfilled in this birth is overwhelming. The true meaning of Christmas can be seen in all of the fulfilled predictions of Christ's birth. John is writing this book after Jesus had already been crucified, rose again, and ascended into heaven. John's testimony is that "we saw Him in all of His glory." 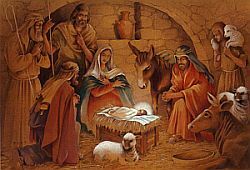 At His birth, shepherds, angels, Simeon, Anna and numerous others were overwhelmed at seeing this baby. 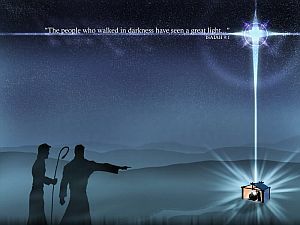 Simeon said, "My life is now complete" (Luke 2: 29). It was just another birth, but then again it was not just another birth. He looked like a baby, cried like a baby, ate like a baby and He was a baby but He was also God in the flesh. It was different. This birth was light shining in the darkness (John 1:5). It was overwhelming. Every time His mother Mary heard another statement about her baby, she made a mental note of it and "pondered it in her heart." We read that phrase over and over. John meant more than just His birth when he said we beheld His glory. He also meant His life. A life filled with miracles. People flooded the streets when Jesus was there because they wanted a miracle for their family. His miracles were well known. Even at His crucifixion we read that Herod was glad to have Jesus arrested because that meant Herod might get to see a miracle (Luke 23:8). Even His words displayed His glory. His words calmed the water, they killed a tree, they made soldiers fall over backwards. His words healed a sick boy miles away from Him, and shocked soldiers who came to arrest Him because they never heard anyone speak like that before. John said, "We beheld His glory" and it was overwhelming to them. Our text, John 1:14, calls Him the only begotten of the Father. A better way to translate this would be to say He was the only unique one. There was never a man on earth like Him before, and there has never been one like Him since then. He was eternal - 1:1-2. Eternal yet born. What a display of power! Read John 1: 1-2 and 14 with me. John is realizing what is so cool about this. He is the eternal God and we saw Him. That is overwhelming. John adds to the wow factor by adding, He was the Creator (1:13). He is the Creator and then He came as part of creation. He entered into His own creation. Now sing "He has the whole world in His hand" and picture that hand as a baby hand. What overwhelming power! Another amazing fact is that He is life (1:4). As a baby, He is new life, yet He is the life giver. Overwhelming! All the facts are wonderful, but the most overwhelming part of the whole story is that He came for you and me. Have you ever heard your child crying and rushed into the darkness to make sure they were ok? Well, we were crying in the darkness so Jesus charged with light and life into the darkness and chased it away. He is the light shining in the darkness (1:5). He had the most beautiful setting possible in heaven with His Father and the worship of the angels, but He left all of that to come into the darkness for us. He came to save those who would kill Him. He knew full well what was ahead of Him, yet He came anyway. He knew how we would treat Him, but He stepped into our darkness to provide light. He loved us enough to die for us. That is overwhelming love! Now He throws out an invitation like a gift to you and me. "As many as will receive Him, He will give eternal life (1:12). This isn't just a nice story, it is an overwhelming story of life and death. Jesus Himself tells us why He came two chapters over in John 3:16-18. Now you've been introduced to the true meaning of Christmas - Christ Himself. He is offering Himself and His sacrifice to you today. Is there room in your heart for Jesus? Do you have Him? Do you want Him? This message was delivered at Calvary Baptist Church in Bellefontaine, Ohio, on December 20, 2009. Special thanks to Pastor Jeffrey Willetts for permission to share this Glory Story with the world.